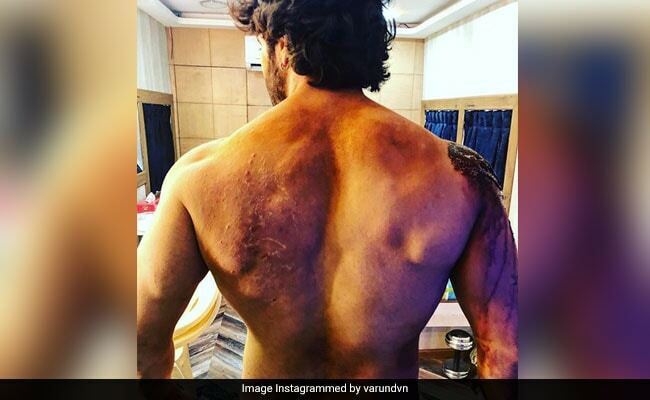 Varun Dhawan left the Internet very impressed with his "hard work" after he shared a picture of himself showcasing his "battle scars", which he apparently got while shooting for a particular sequence of Kalank. The 31-year-old actor, who is currently in Mumbai shooting for Abhishek Verman's film, shared a picture of himself where he has his back facing the camera. "Kalank battle scars. Shuru tune kiya, khatam main karunga," read Varun's caption. "I can understand the hard work behind the superb body," "This looks so awesome," and "Can't wait for Kalank," were some of the several comments posted on the picture. The photo has been liked by Anil Kapoor, Ekta Kapoor, Shilpa Shetty, Ayushmann Khurrana, Huma Qureshi and Sonakshi Sinha. Just a few days ago, Varun had shared a video of himself wherein he referred to a "crazy" sequence in Kalank, for which he is training himself really hard. "I have been training and trying to get stronger for a crazy action sequence for Kalank. My trainer made me try something new today. P.S the mark on back is from cupping." I have been training and trying to get stronger for a crazy action sequence for #kalank. My trainer made me try something new today #donttrythisathome. .p.s the mark on my back is from cupping. Earlier, Varun Dhawan and his Kalank co-star Alia Bhatt were shooting in Kargil for a sequence of the film. Varun shared a post on his Instagram timeline where he talked about his experience of shooting in sub-zero temperatures. He accompanied the post with a shirtless photo of himself and wrote: "Kalank - was in for a huge surprise when it began to snow in Kargil. I have been training for a while but I was not sure how I would shoot bare body with the temperatures reaching -3 degrees. Prashant Sawant was by my side. God is great I managed to complete the scene rest is cinema history. Also Kargil is so beautiful." Kalank also stars Madhuri Dixit, Sanjay Dutt and Aditya Roy Kapur. For Kalank, Madhuri Dixit was roped in to play the role that Sridevi was originally cast in. Karan Johar is the co-producer of the film. Kalank went on floors in April this year. Kalank is expected to hit screens on April 19 next year.